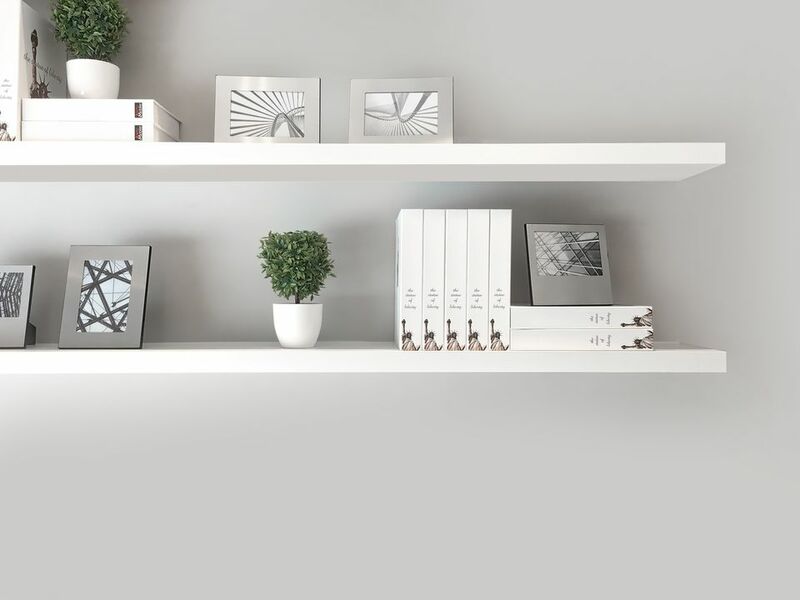 Building bookshelves is a common home woodworking project, whether those bookshelves are utility, free-standing, or built into a wall unit as a series of cabinets. Building a bookshelf or other shelving that needs to support a considerable amount of weight such as a stack of heavy books or some electronic equipment like a television or audio system is tricky. A shelf made of a single 3/4 inch thick piece of plywood or other stock may sag in the middle under the weight of the items after a period of time. Fortunately, if you know the shelves will need to support a considerable amount of weight (perhaps upwards of a couple of hundred pounds), here are a couple of woodworking ideas for super-strong shelves to consider. One idea is to employ an edge similar to a breadboard edge used in many woodworking plans. This type of edge can be applied to dimensional wood stock or along the edges of a thick piece of plywood to cover the unsightly edges of the plywood. This breadboard edge is a tongue-and-groove joint where the tongue is cut on a piece of hardwood that will fit into a groove in the edge of the shelf plywood. The plywood is wrapped on all four sides with this tongue-and-groove hardwood edging, using 45-degree mitered corner joints. This tongue can provide a considerable amount of strength to a shelf, although it can be a bit time consuming to construct properly. Also, keep in mind that if you intend to stain the shelves, the hardwood you choose will stain to a different color than the plywood. You may want to make this a design feature and accentuate the differences in the colors of the wood as you design the piece. Another idea that would be more expensive, but far simpler is to simply sandwich two layers of 3/4-inch plywood to make a 1 1/2-inch thick shelf. This idea should probably be avoided if you're choosing to use hardwood or dimensional lumber, as the expansion/contraction will likely cause undue stress on the glue joint between the two layers. Of course, if you're planning to use hardwood or dimensional lumber, it's easy to obtain 1 1/2-inch thick dimensional lumber (such as a 2" x 12" board) or to plane down a much thicker piece of hardwood. However, this technique of sandwiching two pieces of stock with glue between the pieces is ideal if you intend to use two layers of plywood. Simply apply a thin, even coat of a quality woodworking glue like Gorilla to all of the mating surfaces and press together, holding the sandwiched layers with clamps until the glue dries. Once the glue has dried, remove the clamps, scrape off any excess glue that escaped the joint, and trim the exposed face with a piece of 1" x 2" in the wood of your choice. Begin with two pieces of plywood that are slightly larger than the finished size, in case the two boards are slightly offset after the glue dries. In that manner, the sandwiched plywood shelf can easily be trimmed on all four sides to get to the desired finished size. The 1" x 2" trim board can then be attached to the edges of the shelf using biscuit joinery or finish nails. How Do You Cover Exposed Plywood Edges?